Waiting two weeks for my Bang Out a Sweater yarn to arrive has given me the chance to wallow in all the Banging Out of Sweaters that is going on. I’ve knit this Stopover sweater in my head at least three times by now. I have been studying everybody’s projects over in the Bang Out a Sweater group, reveling in the chance to see so many versions of one sweater. I’m suffering from colorway envy and loving the sight of knitters modeling their finished Stopovers. So happy for everybody who’s made it to the other side. Plütolopi yarn is like no other I’ve ever seen. My moment of swatching with Julie’s plötulopi only whetted my curiosity, so I’m eager to trade info with other souls working with this peculiar product. 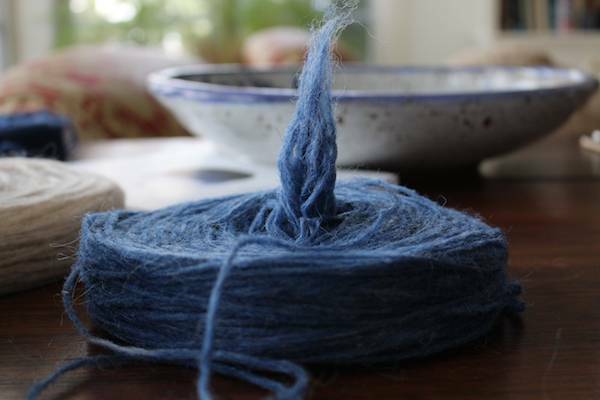 Hélène writes that this unspun form of lopi yarn was scorned as lazy yarn—too lazy to spin it, apparently. Maybe that’s why this yarn is resonating with me! The four plates of Winter Blue Heather arrived in a unit, yanked apparently from the comfort of their Icelandic life with 14 other plates. They may be jellyfish, for all I know. The tentacles are intertwined. Maybe they’re spawning! I really, really love the roughness of this stuff. It’s not scratchy, but it is definitely hairy. It feels like it may all fall apart if I squeeze it too hard. I’ve been debating whether to knit this yarn doubled, in order to increase the durability of my Stopover. Now that I see plötulopi in real life, I think I really do want to try it single, to see if a sweater made of this flurf is as light as I hope it will be. I think there’s a troll stuck in there. I love Plutolopi. Knitting it singly is definitely the way to go; as Meg Swansen (yes! Swoon!) pointed out to me on a Zimmermann group thread on Ravelry one time, anything knitted in double stranded Plutolopi is going to be MADLY warm. Ditto! Love the colors, Ann. 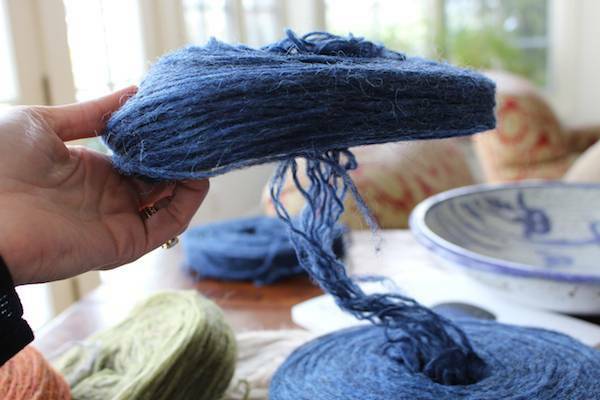 Love the adventure of you using this yarn, too. Knit on, girl! The trolls got it goin’ on! Love it! It was definitely worth the wait! And don’t worry – plenty of us are still bangin’! Troll sighting has made my morning ~ and I finished my sweeve (swatch/sleeve last night! Bang on, my Troll Generation friend! I am dying to see how this turns out! I have had unspun on my wishlist for ages. I am afraid of how much breakage I would have. This fear is born out of my experience as a lefty mirror knitter. I wrap the yarn the opposite direction of standard righties. The result is that single ply yarns unspin as I knit them and I have to periodically stop and respin or I get breakage. In my imagination as it’ll be light as AIR but *super cosy* and also a Rams and Yowes or adaptation of that pattern. A plutoloopy Rams and Yowes, wouldn’t that be amazing?! Now, why did you have to go and write that!! 🙂 This yarn has my cold sheeping resolve weakening and then you had to write ‘I have a mad desire to make a blanket out of this stuff”, my favorite project. I will not go look at colors, I will not go look at colors, I will not go look at colors…. Beautiful colors! Don’t worry about being late to the party. I’ve just started my first sleeve….hard for me to get my mojo going on dpn’s. I am interested in seeing your results. this could be a future obsession for me. Wanted to start sleeves this past w/e and can’t find #9 dpn! Too many WIP. Expect delivery any day, miss my LYS. I’ve made three Icelandic Overblouses (from Knit One Knit All) using only one strand. They are my favorite sweaters – light and warm and cozy. Yes, it breaks, but it spit splices together in an instant and I’ve never had the finished fabric snag. You’re going to love it! Thanks for mentioning that pattern! I have the book and brought back enough “plate lopi” from my October Iceland trip to start knitting an overblouse as soon as I finish my Stopover. You’ve made my day! Beautiful colors! Single Plotulopi is the perfect Lopi for Southeast winters. Light, warm and ideal for layering for our crazy temperature swings. This will be soooo interesting! Looking forward to your WIP snaps. And every time I read Hélène Magnússon’s blog I am overcome with dreams of visiting Iceland. Yay!!! The required needles came on Monday and my Order of Léttlopi arrived this morning all the way from Reykjavik too! I have fondled and pondered and just looked at all the fibrous wonderfullness and fallen in live with the saturated colours. Can not wait until I can cast on – tomorrow, as my hands are smelling of the jerk sauce I am currently bottling! I’m pleased someone succumbed! While I’m not sweater alonging, I did order 8 plates for a circular “shawl” which will really be a blanket. Make than an oven, as it will seemingly generate heat. Ahhh..troll hair wishes I kept my little family with all the homemade clothes with two circles cut for the arms. Thanks for the memory! What gorgeous colors!! I can’t wait to see a picture of some knitting. Well, my sweater is ready for the neck ribbing. I put it on a life line last night and tried it on. Unfortunately it’s a bit snug. I know that it will stretch out about a stitch per 4″ as Kay found on her swatching which adds about 2″. I really would like 3″. Hmmm. More measuring to follow. But…. if you had told me I could knit a sweater in 10 days I would never have believed you. Especially one that isn’t full of loopy holes. I love it!! Have a baby sweater to bang out too. I can save the sleeves. We’ll see. I made a “box the compass” sweater from plutlopi many years ago. It lasted to years of constant wear before it began to fray at the elbows. My son administered the coup de grace when he moved the washing machine dial to full hot water wash when he saw it had ‘somehow stopped after it filled’ it was full of my knitting 🙁 ! I loved that sweater. A light spit splice will fix any breaks. The yarn is amazing. I haven’t even started the sleeves yet! Though hopefully later today. That said, this is going at record speed compared to my usual pace. Ann, I rejoice with you. So.Happy. that your [yarn stuff] finally arrived! And that you will be able to start before everyone else finishes! Hehe. Whoa at the tips for knitting plutoloopy. I ordered mine from School House (Meg Swanson) and it’s sitting out in my studio while I finished my first version in the alternate yarn. Glad I waited and read all the comments as I was about to charge off, knitting with two strands. The stuff is so pretty! LOVE your colors! It’s gonna look great on you. I want to knit with flurf. Not only are people still knitting, people are still starting. (Am just above the sleeve cuffs.) Reveling in these amazing colors! The plates are also beautiful and I too might just bang out a blanket or another sweater in flurf – after this one. Can’t wait to see how it goes for you. Great color choices! I am having such a love affair with my plotulopi right now. It’s hairy and sticky and break-prone, yet I adore it. It’s scratchy and soft, ethereal and dense. There are tiny tumble weeds of it all over. Like a good man . . .
“Tiny tumbleweeds.” Would that be “children” in this analogy? The break-prone-ness of that makes me nervous for you, but I look forward to seeing how it goes. I’m also happy that you’ve begun the second wave of the Bang-along because I had my yarn, but was working on another project. If I start now, I won’t feel so far behind. Hooray! 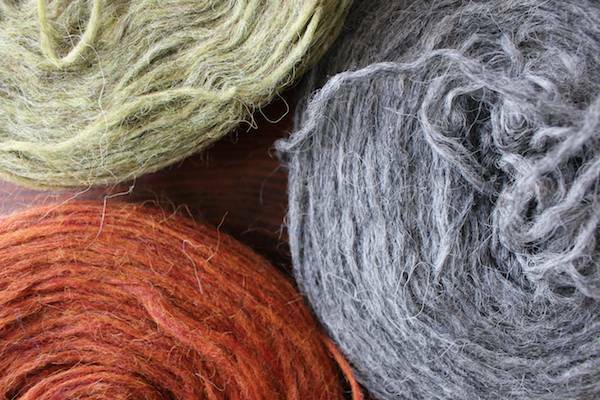 Can’t wait to see how it knits up — and love your color choices! I have 8 plates of that same blue! With the same troll hair. They must have came from the same stack of plates. Trying to find the right end resulted in lots of baby balls that spit spliced together into a soft medium ball. Most of the tangle came from below, the next plate in the stack. I’m hoping that happens with the next batch of troll hair on the next plate. Only problem I had was when I had to frog a couple rows to remove the twist that crept in there when I wasn’t looking. It got a bit thin in places then. I was able to splice everything with no problem, but glad I got an extra plate just in case. I finally pulled the trigger on my yarn purchase today! I could not decided on colors and finally made the decision. Now to wait for my package from Iceland! 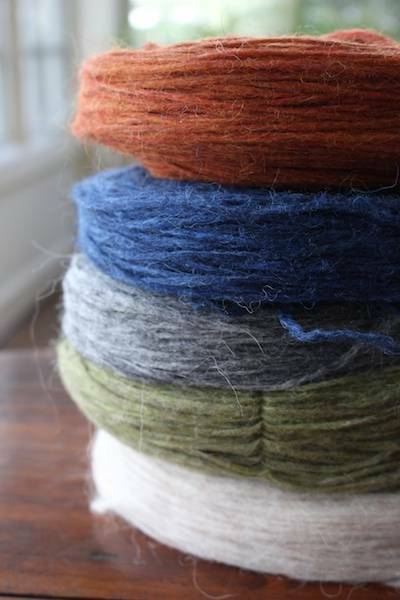 The “rolls” of this wool, that I always purchase from The Schoolhouse Press, are very addictive and beautiful. Have Fun !